I’m a huge fan of anything Sherlock Holmes. I’ve read the books, watched the TV series, and own the films. Heck, I even own some of the Sherlock Holmes stories on vinyl. Needless to say, I’m a huge fan. We’ve seen a ton of incarnations of the famous British detective over the years. Recently though, Holmes has become very popular due to the films that starred Robert Downey Jr. as Holmes and of course the hit BBC series ‘Sherlock‘ that stars Benedict Cumberbatch and Martin Freeman as Sherlock and Watson respectively. The amount of fandom for these projects have even spawned new shows and other films in the past year or so as well. It just seems that we all can’t get enough of Sherlock and those famous suspenseful mysteries. That brings us to ‘Mr. Holmes‘, which is a small indie film directed by Bill Condon (‘Twilight: Breaking Dawn I & II‘), that does not follow the same formula as the past Sherlock Holmes films and tv shows did. 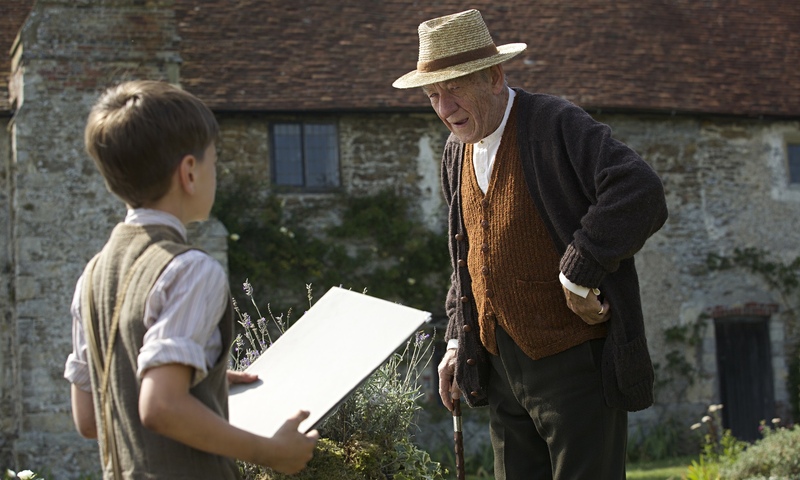 In fact, the Sherlock Holmes in this movie is 93 years old and is played by Gandalf himself, Sir Ian McKellen. If you’re looking for a suspenseful and thrilling Sherlock Holmes mystery, then this is not the movie you should be expecting. Instead, we have a retired and very old Sherlock tending to his bee colonies at his ocean side home some 100 years ago. Sherlock lives in a big estate with only his housekeeper Mrs. Munroe (Laura Linney) and her young son Roger (Milo Parker) to take care of the grounds and Mr. Holmes himself, who is suffering from Alzheimers now. As the film plays on, we see flashbacks to Mr. Holmes’s last case, as he tries remembering what actually happened, so that he can write his own story now to be published and correct the theories that his dear and deceased friend Watson wrote about in years prior. We get small glimpses at the once bold and quick witted man Sherlock once was, but now, he is more or less a crotchety old man with flashes of fun, especially when the young Roger takes an interest in bee-keeping and his old stories. Like I said, above, there really isn’t a big mystery to solve here, although there is a mystery in watching Sherlock himself trying to remember what just had happened in his last case that made him quit the detective business. The film runs at a slow pace, but there are enough moments of charm and great acting from everyone to keep your interest. Sir Ian McKellen is simply brilliant as the 93 year old Sherlock Holmes. In real life, McKellen is 76, but he plays a 93 year old so well, that I thought he was 20 years older than he really was. The way he moves his face and body is just simply brilliant, and you can’t help by love him on screen. Linney turns in a solid performance as well, but her on-screen son Roger, played by Milo Parker is fantastic. I have a feeling that he will be the new child actor to watch out for. Even though ‘Mr. Holmes‘ isn’t your typical thrilling or action-packed Sherlock Holmes film, this particular movie about the famous detective will still have you entertained and happy you saw a new side of such an iconic character. This entry was posted on Wednesday, July 15th, 2015 at 12:10 pm	and is filed under Film, News. You can follow any responses to this entry through the RSS 2.0 feed. You can skip to the end and leave a response. Pinging is currently not allowed. « Film Review: ‘American Girl: Grace Stirs Up Success’!